How do I play Burn 3? The goal of blackjack is to get closer to 21 (without going over) than the dealer (C). All face cards count as 10, and aces can count as either 1 or 11. 1. Before the cards are dealt, you must choose how much to virtually bet. Use the +/- buttons (A) to set the virtual bet amount, and the select SET BET (B). 2. You are dealt 2 cards (D). You then have to make decisions based on those cards. If you choose ‘Hit’ (E), you will receive another card. You may hit as many times as you like, but if your card total exceeds 21, you will lose the hand. Choose ‘Stand’ (F) to stay with the total you have. You will not receive any more cards for that hand, and your total will be compared against the dealer’s total. 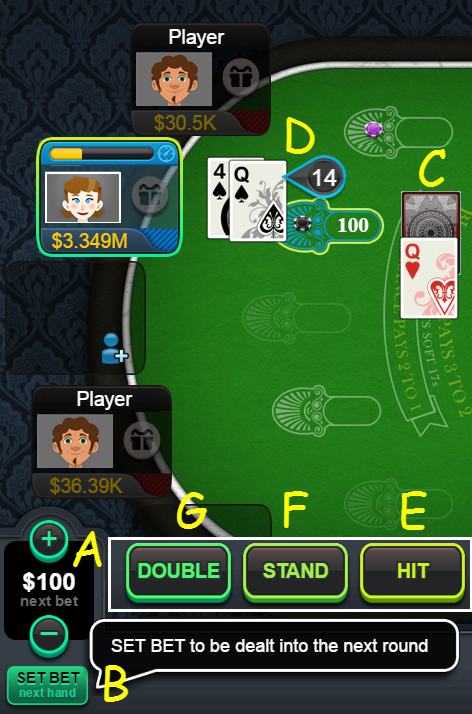 Another option is to select ‘Double’ (G); your virtual bet will double and you will receive only one more card. If you are dealt a pair, you have the option to ‘Split’ the hand into two independent hands. A second virtual bet is placed (equal to the first), and each hand is played separately. (Note: If Aces are split, only one additional card per hand is allowed.) Players may split up to three times, creating four simultaneous hands. 3. The dealer's cards will be flipped, revealing their total. 4. Your total will be compared to the dealer's total. If your total is closer to 21, you'll win the hand. If the dealer's total is closer to 21, you'll lose. For more information, please checkout our Blackjack Guide. How do I virtually bet in Roulette?